For a tropical country such as Malaysia, every inch of land would be under forest or would have been under forest cover sometime in the past. I am always willing to acknowledge that all our agricultural activities, our industrial land, our towns, cities, highways and airports have replaced forests and have affected biodiversity or have released green house gases to the atmosphere . Every country has sacrificed some of their land for agricultural and other uses over the years when they undergo the process of development. Some use their land extensively for agriculture, others don’t. Others have not yet the time or the funds to develop their land, as is the case with many developing countries. 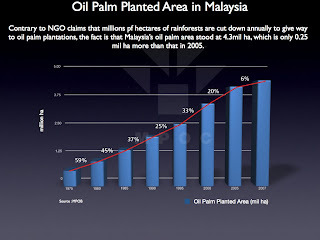 Current debate by some NGOs is tending to link agricultural activities with deforestation. To have a healthy debate, there must be some definitions. For example, what percentage of our country’s land area is allowed for agriculture, and what percentage should be conserved as forests. Would this percentage be uniform as an international benchmark, or should it be different for developed countries as compared to developing countries. If it is different who is to determine what is the right percentage, especially for those developing countries which since achieving independence from their colonial masters have not been able to develop their land for agriculture. In Malaysia, oil palm and rubber are major agricultural crops. Some NGOs try to allege that oil palm causes deforestation, but they never made such criticisms on our rubber industry. If we cannot grow oil palm we surely will grow rubber, cocoa, coconuts etc on our agricultural land, and get on with our daily life. If we use 24 % of our land for agriculture, is that wrong. What if we use 30% for agriculture. Why cann’t we follow the UK which used up to 70 % of their land for agriculture and enjoy a good standard of living as a result. Are we not allowed to enjoy a good standard of living? Put it in another way, if the UK were to only use 8%of the land for agriculture as in Sarawak, it is likely that their standard of living would be lower than what they enjoy for now. Why don’t we set up an international standard for the percentage of agricultural land allowed for each country. Let us start with a range of 30 to 50 % allowed for conversion to agriculture. In terms of carbon footprint, related to global warming, those countries keen to comply with the target and bring their agricultural land ratio to below 50% can reforest their land accordingly. Those countries still having less than 50 % of their land under agriculture can be allowed to develop according to their development needs. In times of food shortage, it is important to expand food production by making land available for agriculture. If 50% of arable land is allowed for agriculture and up to 50 % left as forest, there will be a fair balance for wildlife habitats and human food production capacity. It will be good if the NGOs provide leadership in coming out with the guidelines. Otherwise, we argue on different assumptions and understanding on what constitute deforestation. Some even post personal criticisms from such misunderstanding. It is important to have an open debate. In our recent sustainability conference, I raised a few bold ideas in front of 500 attendees, but no one was bold enough to challenge my statements. Later some criticisms were raised in the NGOs websites. So much for being bold or otherwise. Perhaps in country’s like Malaysia, a few more definitions need to be made. For example, what about protected tourism forests, which have small tourist facilities (trails, guardhouses, bridges, lodges, etc.)? Would these be counted as the 50% of forest which has been preserved? If so, then how much development does one do in a forest that makes it ‘unpreserved’? Can such a rating be measured scientifically, using indicators like the amount of remaining biodiversity after development, foliage density, etc.? Then again, if construction of a forest guardhouse leaves all the trees unfelled, but if the animals have chosen to leave due to the proximity of humans to them, can it properly be considered a preserved forest? It is very noble and farsighted to come up with such limits, but they must have an accurate and reliable measuring system. Moreover, what happens in emergencies, when trees HAVE to be cut down? For example, forest fires sometimes require firefighters to cut down the area around a fire to prevent it from spreading. Would this be counted as a violation of the allocation? From this, I would like to propose an amendment, that 50% of our land be preserved as forest, but that we stop deforestation at 52- 53% to make sure that during exceptional emergencies, we do not accidentally break the rule. But to logically maintain the target, the traditional causes of deforestation must be controlled: agriculture (of all kinds) and overpopulation. Birth control and biotechnology, are therefore the two B’s to keep in mind when deciding what of our forests go, and how much remain. One thing’s for sure, to realistically set a 50% target, palm oil biofuel MUST be replaced with cellulosic ethanol. Thank you, Datuk. You make an excellent point and one that I have always supported. But I am frustrated that in the process orangutans are becoming extinct. I look at Rwanda and gorilla ecotourism and Costa Rica and wonder if developing ecotourism would actually benefit your country, more of the population. Do you feel that the economic gains from you Council positively affect the economy of 50% of the population? I see that you have orangutans on an island as a show of good faith but is there a way for your country to be smarter than the developed countries were…to use your resources to support Nature and gain wealth from this? I don’t know the solution. Is it possible to boost production of the plantations? I understand there is a lot of land that is not planted but that was cleared. It cannot be a solution if we wipe out species.